A skull from the excavation of the Philistine cemetery by the Leon Levy Expedition to Ashkelon. Hidden in the soil of Ashkelon, an Israeli seaport 35 miles south of Tel Aviv, are secrets from the ancient world that Harvard scholars have been uncovering for decades. Not very long ago, they struck a treasure trove of bones. For years archaeologists have searched for the origins of the Philistines, famously known, via the Hebrew Bible, as the archenemy of ancient Israel. The cemetery both shines an important light on the group’s history and sets their ancient burial record straight. The expedition, nearing its end after 31 years in the field, is sponsored by the Harvard Semitic Museum, Boston College, Wheaton College, and Troy University, and is licensed by the Israel Antiquities Authority and the Israel Nature and Parks Authority. For the past three years, researchers have gently unearthed 160 individual remains: men, women, and a few young children, most buried in simple pits, some in stone-lined chambers, others cremated. Many of the dead were laid to rest on their backs along with personal items such as jewelry, weapons, or ceramics. A large number were “accompanied by two storage jars, one of which is often topped with a bowl, and then a little juglet on top,” said Master, adding that the role of the objects in burial remains a mystery. It’s the bones themselves that may offer the best insights into the lives and ancestry of the Philistines. Researchers will use DNA, radiocarbon, and biological distance testing in the coming months and years to help determine the Philistines’ exact origin, looking to support the long-held view that they were “sea peoples” who migrated to the area from the West around the 12th century B.C. 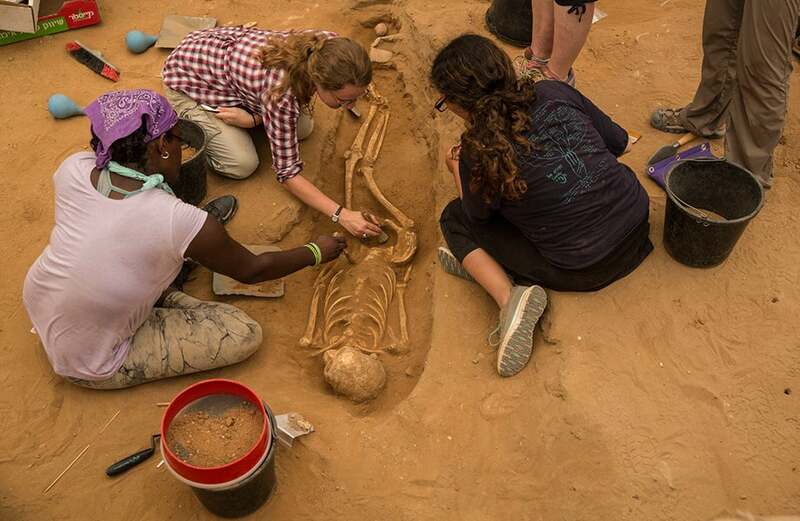 Careful examinations of the remains will also help scholars paint an accurate picture of how the Philistines actually looked, how tall they were, how healthy they were, and even how long they lived. Since 1985 the Leon Levy Expedition has carefully excavated the 150-acre site nestled inside a national park on the edge of Mediterranean. The ancient seaport, whose history spans from the Bronze Age through the Crusades, has yielded vivid clues to the lives of its past inhabitants: Canaanites, Israelites, Philistines, Babylonians, Phoenicians, Mycenaeans, Greeks, and Romans. Findings have included pottery, coins, jewelry, and statues, as well as various examples of advanced architecture, such as the oldest known arched gateway, dating to 1800 B.C. Discoveries at the site point to both the beginning and the end of Philistine civilization at Ashkelon, and, contrary to lore, their level of sophistication. 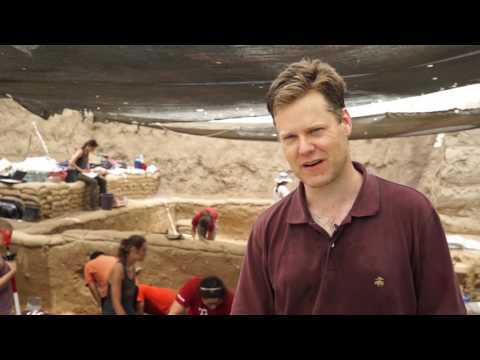 Elite Philistine houses dating from the 12th-10th centuries B.C. have been uncovered, along with a “snapshot” of the city’s once-bustling marketplace, frozen in time when the armies of the Babylonian king Nebuchadnezzar II set Ashkelon ablaze in 604 B.C. “It’s a bit of a Pompeii moment,” said Master of the marketplace, which was discovered in 1992. The remains of wine and grain shops along a busy thoroughfare, as well as ancient receipts from the buying and selling of those goods, shed light on the Philistines’ thriving economy. Coming face-to-face with the Philistines has been a highlight for Harvard’s Adam Aja, the man largely responsible for the close encounter. Recently he had met with a retired worker from the Israel Antiquities Authority who claimed that almost two decades prior he had uncovered human remains near the city’s northern edge, roughly 60 centimeters from the surface. The day before members of the expedition had scoured the area the man had described, an unexplored corner of land outside the ancient city’s walls. They dug one hole after another. Each time the result was the same: nothing. Aja had returned for one last try accompanied only by an Israeli worker manning a backhoe. The results were so far the same. Above all, Aja had his direct connection to the people he had sought for so long. Finding the occasional earring lying in the street, or a bead mixed in with ruins, paled in comparison, Aja said, to finding such items on the remains of actual Philistines. The work pace is unrelenting at the site, which for summers through the decades has doubled as an outdoor classroom for both students and volunteers. A daily wakeup call comes at 4:30 a.m., followed by a quick breakfast. Prep work at the site begins before dawn and digging lasts until around 1, followed by lunch and field school classes. Staff members and volunteers are back at the site from 4 to 6 p.m. processing the day’s finds. Many staffers spend additional hours at night washing, photographing, and documenting artifacts. It often adds up to 12-hour days, often in brutal heat. But the effort has yielded huge rewards, said Aja, who has put in “a lot of double shifts” in recent seasons to help the expedition wind down. 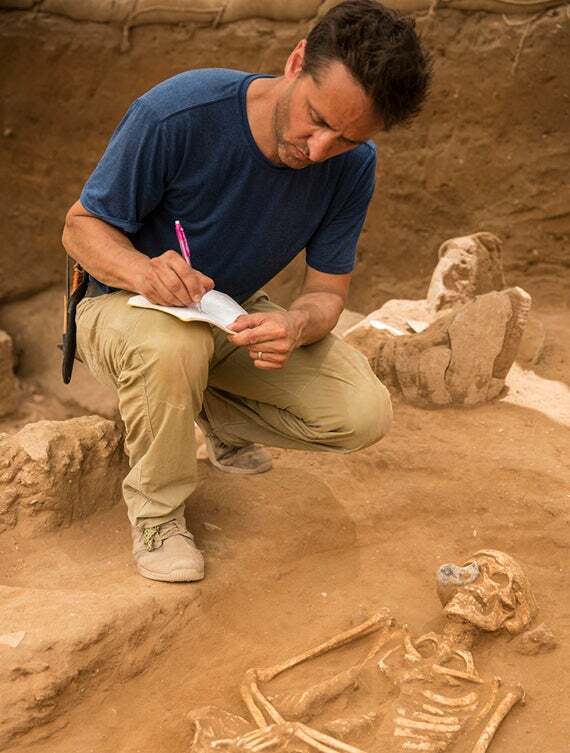 Researchers from the Harvard-backed Leon Levy Expedition discuss a “moment of history that has never been seen before” as they uncover 160 individual remains that will provide insights into the lives and ancestry of the Philistines. Jill Lepore, David Woods Kemper '41 Professor of American History at Harvard University.